Now the shovel will be your main weapon in the fight against other players. Once you get to this Spleef, you get only one tool that is a very formidable weapon, superior to swords and bows. With the help of a shovel, you have to dig out the blocks under your opponents' feet after which they will fall down. Not everything is so good at the very bottom of the map, there is lava everywhere. If the participant of the game falls into the lava, then in any case it's death, you can not get out of there. The great advantage is automatic map reboot, that is, you do not need to save copies of files, the mechanism will automatically restore the arena if you click on the button. Players only need to take shovels and go to the arena (the buttons are in the spawn). You can count down and after that every spleefer must take care of his life. Do not look at the footsteps or stand in one place. If the list of players is large, then divide into several teams with the same skins. 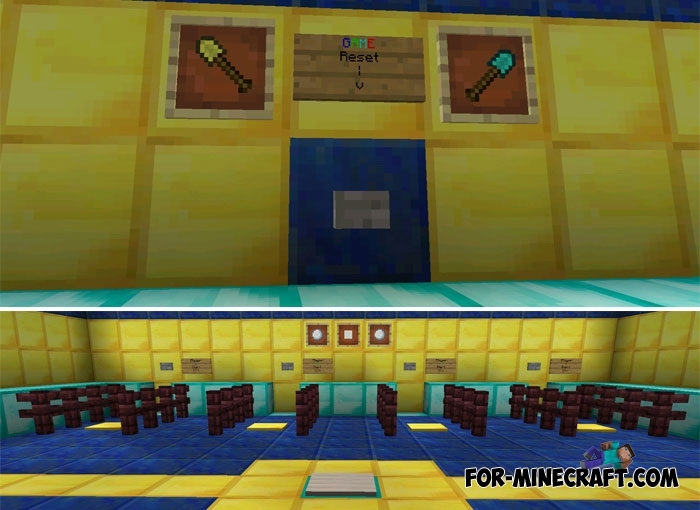 Gravity Falls map for Minecraft PEHere you can visit those same places where Dipper and Mabel..